What would it take to get a group of maybe 5 non-Christians along with 5-10 Christians into your home to talk about spiritual things for a few hours every Friday night? For Phil Proctor at Sterling Presbyterian Church (OPC) in Sterling, VA it’s a free dinner and some intentionality. 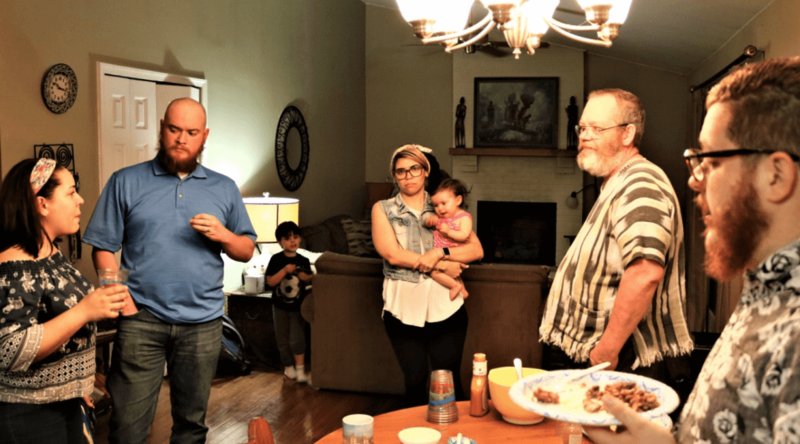 Two months ago, he started a “Friday Night Fellowship” with a simple premise: We’ll open our home and invite people to have dinner together and talk about a spiritual topic for the night. If somebody shows up-great, if not—great. Well, people have shown up. No doubt Meredith Proctor and her spaghetti, lasagna, enchiladas and other dishes play a nice role in the success! An average night has about 8-10 people from the church and 3-5 unchurched who are usually very different from “a typical OPC crowd.” They are often liberal politically and diverse ethnically. The invite process is pretty simple. Phil posts the meeting on Facebook and meetup.com with a clever title (i.e “Where are you, Superman? (or how are we rescued from brokenness? )” He encourages people in the church to invite unchurched friends. And they see who the Lord brings. They’ve had some challenges. After a nice run, one night nobody outside church members showed up. They took the opportunity to talk about outreach in the church and how to improve the Friday Night Fellowship. 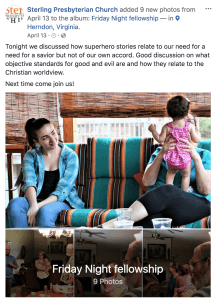 Or sometimes conversation can move to controversial topics and the Christians in the group have to wrestle with how to handle that—how to allow the unchurched to express their views, how to not add offense to Christianity beyond the cross, and challenges we would all wrestle with in these discussions. On the night no visitors showed up, Phil wondered if the idea was working and wondered if he should shift gears. The next Friday, the Lord encouraged them with 3 unchurched people and a great evening and discussion. Phil is very encouraged at the progress so far and hopes to continue it long-term. In just two months they’ve probably met and had discussions with 20 people that almost certainly would not have ever happened without the intentional step to provide a space for it. These are people they can pray for and with whom they can build relationships. He hopes that in time, the unchurched will become comfortable with this particular group of Christians and spend more time together and they will see them come to church or other events. It’s interesting to note, Phil doesn’t see himself as a good evangelist. He’s introverted and needs to be intentional about outreach. But note what a bit of intentionality has produced. We look forward to checking in down the road to see what the Proctors’ Friday Night Fellowship continues to produce. If you think of it or are in position to make it happen, maybe this outreach effort in Sterling, VA could make it onto your church prayer list for a week or two. Would this work in your context? How? Who? Where? Or is there some other “space” you could create for this type of discussion and fellowship? Who Will Attend Your Church This Sunday?